Melbourne is an artistic powerhouse with a vibrant and multicultural soul. 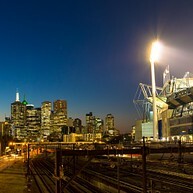 Nicknamed "Paris of the southern hemisphere," Melbourne is not only known to be Australia’s cultural hot-spot, but is also famous for its major sporting events and its culinary delights from all across the world. 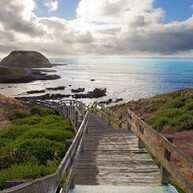 With its high-rise city centre and far-reaching suburbs, it is hard not to be dragged in by the life of the capital of Victoria, but day trips to the wild nature of the state are also extremely attractive. Opening hours: Most shops and businesses are open between 9am-5:30pm on weekdays and Saturdays. Sunday trading is also becoming more common with shops being open from 10am until 4pm. It is not without reason that Melbourne is often dubbed the world’s most livable city: the vibrant metropolis has plenty of attractions to visit and landmarks to see. 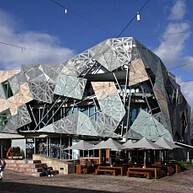 Here are some of the main attractions that will show you the parts of Melbourne that the city is so famous for. This futuristic plaza is one of the most complex and ambitious construction projects ever undertaken in Australia, serving as Melbourne’s civic centre with cafés, restaurants, an amphitheater and several museums such as the Ian Potter centre with Australian art. There’s also a farmers market every Friday and a book market on Saturdays. 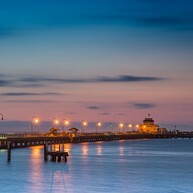 St Kilda is one of the liveliest and most colourful areas of Melbourne right on the Hobson Bay. Acland and Fitzroy streets are the main roads with bars, restaurants and shops. The cake shops are just too tempting! In the late afternoon, take a stroll along St Kilda Beach to watch the sunset. The zoo in Melbourne is one of the world’s oldest zoos, famous for its large collection of native animals in a spacious bush setting. There are over 2,000 creatures to admire here and it is located only minutes north from the city centre making it a great place for the whole family. This innovative museum houses an Aboriginal centre, a rain forest, a set for the world famous TV show "Neighbours" and much more. For a couple of extra dollars, you also get the entrance to the next-door IMAX theatre. You can easily spend a couple of hours here. Arguably one of most beautiful botanic gardens in the world and the perfect place for a relaxing and picturesque picnic. It displays more than 50,000 plants and is undisputedly one of Melbourne's most popular tourist attractions. Defiantly worth a visit on a sunny day in Melbourne. Towering 279 meters above ground level, the Eureka Skydeck (Melbourne's observation deck) offers breathtaking 360-degree views of Melbourne, with an on-site café if you want to enjoy the sight for a while longer. It is the perfect place to relax after a long walk around town. The Old Melbourne Gaol was established in 1841 and remains a fabulous insight into Melbourne’s historical past. The notorious bushranger Ned Kelly, along with dozens of others, were once executed within its walls. The night tours are as spookily good as they should be. The Melbourne Aquarium contains multiple marine animal species native to the Southern Ocean and the Antarctic. Highlights include a 360-degree fish-bowl viewing area or, if you dare, try diving with the sharks! 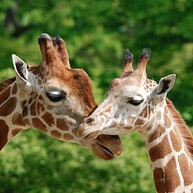 You will also find the largest collection of seahorses and sea dragon species in the world. This museum gives an excellent account of immigration to what today is modern Melbourne over the last 200 years, using audio and visual displays. The museum continue to explore the topic of migration via an ever-changing array of fascinating temporary exhibitions. This nature reserve offers plenty to entertain visitors, but its definitive highlight is the nightly parade of penguins returning ashore and heading to their sand dune homes at sunset after spending the day hunting for fish. 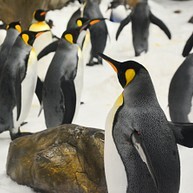 Expect to sight anywhere between a couple of hundred to a couple of thousand penguins. When in Melbourne, one must visit the bohemian Brunswick Street in Fitzroy, an area which is well known for its many bars, cafés, restaurants and unique boutiques that remain busy any hour of the day. Catch an indie music performance, see an art display or shop at the area's exquisite boutiques. Enjoy a full day tour with Winebus and visit four wineries, with a wine tasting included. The knowledgeable tour guide will share interesting information and show you around. It also includes a one course á la carte lunch at the Oakridge Winery restaurant. 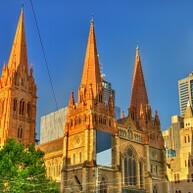 St. Paul's Cathedral is located in Federation Square. 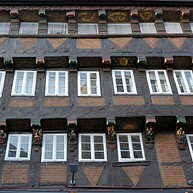 This beautiful and historic building is set right next to modern buildings and is a good example of the old meeting the new. The cathedral is built in neo-Gothic style and was consecrated in 1891. Sport is a very important part of Melbourne culture and National Sports Museum displays wonderful collections of cricket, football, Olympic Games, soccer and many other sports artifacts. This is a great place for the whole family; the younger visitors will certainly enjoy the on-site interactive games. Funfields is located 40 kilometres north of Melbourne and is an outdoor family fun park with rides to suit all ages. Here you can enjoy limitless rides all day on all attractions including toboggans, go karts, water slides, pony express carousel, the water playground and much, much more. 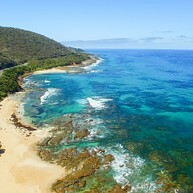 A trip along the Great Ocean Road offers magnificent views over the southern coast of Australia. The Twelve Apostles, large rocks rising out of the sea, are an especially interesting sight en route. Go on a guided tour or rent a car to fully experience this amazing place.